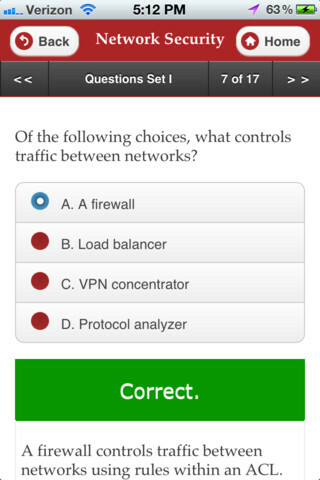 If you like this sample, you can get the SY0-501 Security+ Practice Test Questions here. Each quizzes give you 3 random Security+ questions. These questions are derived from the CompTIA Security+: Get Certified Get Ahead: SY0-501 Study Guide plus extra questions added to the site after the book was published. Flashcards, slides, practice test questions, audio, and more. In-depth coverage of all six domains in the CompTIA Security+ SY0-301 exam. App includes 275 realistic practice questions to help you assess your exam readiness. 175 flashcards to help you review important testable concepts. Hi, I passed the security+ exam last april 14 using darril’s book. I just saw the performance based questions posted here and this is exactly what appeared in the 4 simulations at the beginning of the exam. I was able to answer all the simulations because I understood the concepts of the subject. Thanks to Darril Gibson. I hope he can also write a book for the SSCP and CEH certification. Congrats on the pass and great to hear the book helped. I do have an SSCP book out. You can use this URL http://ow.ly/w5BHH or search Amazon on “Darril Gibson SSCP”. Nothing on CEH right now though.